I've been anticipating the release of Mystery Rises since first reading Mystery Falls back in December for a blog tour. The world Marilyn Phillips created completely drew me in and the characters managed to stay with me to the point where when I started Mystery Rises, I didn't find it that difficult to get back into the story-line despite the fact it had been almost a year since reading the first novel. This may seem like a poor point to some, but when I'm able to get into a sequel that easily, it means I've really enjoyed the series so far. The Mystery Falls series has definitely become one of my self-published treasures! Both Shadow and Samantha's families are enemies, and in an attempt to keep them apart, Samantha's dad orders Shadow to stay away from Samantha for exactly three months with no communication whatsoever. Determined to listen to her father's requests in hopes of eventually freely being able to be with one another, Shadow leaves. Mystery Rises kicks off in the middle of his absence and although Samantha's relationship with her cousin has gotten better, Samantha can't help but constantly ache for Shadow's return. The whole situation with Shadow and Samantha's feuding families gives the series that Romeo and Juliette feel that, although hopefully doesn't end in the same fate, provides the story with added drama. Throw in the supernatural-angel aspect and Mystery Rises quickly became a novel that was hard to put down! With Shadow's absence comes along a new character, more specifically, a new male character. This character who goes by the name of Logan has close ties with Shadow-- he's his brother. I'm going to be completely honest, the "love triangle" red flags were waving frantically in my head and I had my fingers crossed that the story wasn't heading in that direction. Although at first this did seem to be the case, it never managed to cross that line and I'm so thankful for that (because honestly, no one compares to the perfection that is Shadow)! The first 20% of Mystery Rises was Shadow-less, and as a Shadow fan, I was craving his entrance. His appearance really got the plot moving and seeing more of his relationship with Samantha made me all mushy inside. I can only describe their relationship as sweet, intense and of course, swoony! I loved seeing their relationship grow and evolve into something even more beautiful than it already was....plus, getting to see Shadow's attractive protectiveness over Samantha was an added bonus! The one thing that made me want to shake some sense into Shadow was his reluctance to believe a certain someone he considered to be a friend as someone who in reality didn't have his best interests at heart (Even though Samantha kept begging him to open his eyes). This created some tension between Shadow and Samantha that, although frustrating, made their loving moments even more enjoyable. A smug smile crept onto my lips, I said, "Is that jealousy I detect?" "No. Not jealousy. Possessiveness. You're mine. You will always be mine. Just like I'm yours, and will always remain yours." "I love you. I will always love you. No matter what happens. No matter what the future brings. That will never change." Overall, Mystery Rises kept me hooked right until the very end. The cliffhanger Marilyn Phillips chose to torture us with has me going a little nuts for book three! I really hope these characters I've grown to love get the happily-ever-after ending they deserve--- please let them get the ending they deserve! PLEASE! If you haven't heard of this series before, check out my review for book one HERE! 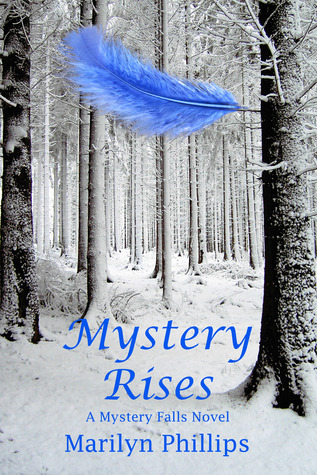 Have you read Mystery Rises? Are you as in love with angel novels as much as I am? Be sure to let me know in the comments below! Keep Reading! Thank you so much Caitlin for an awesome review. I'm pleased you enjoyed it and are looking forward to the final installment.